Music Composition: the present web page will discuss this subject as perceived my me personally, as an individual composer. I will often refer to specific musical terms: for the untrained reader, I promise to do my best by clarifying them as much as possible. Links to pages of related material will be added regularly. Music Composition. Let me start with my personal history in regards to composing music. I did not come to study this subject until much later in my life. Two of my theory teachers (in Greece and Austria) insisted on my deciding for composition instead of piano: I did not listen to them, partially because I did love piano too much, but also because I did not think I had a "composer" personality! Of course, I did not know exactly what such a personality should feel like-but this is another story! I guess, I could write a lot about my music composition theory: if there is ONE thing I am pretty sure of is that there exists no such theory! At least, not for me. Therefore, I will prefer to give examples through my works. The specific compositions, that are listed below, have been chosen for only one reason: they show clearly the beginning and further development of my style. In September 1994, Harald Becker, a German baritone with whom I had performed Schubert's Winterreise a few months before in Thessaloniki (Greece), asked me to write three to four Greek songs for him. I decided to use a cycle of ten meditation-poems I had written between 1976 and 1986. Not having any particular ambition to "become a composer," I soon started to enjoy the process. The cycle was finally performed June 7, 1995. Threnos was my second music composition realized at the electronic studios of the University of Iowa: this time though,the requirement was to include one or two "live" performers. In addition to that, we were asked to deliver a score that would clearly depict both the performers parts as well as the electronic (tape) part! Now, THAT was a challenge: and I do love challenges! So, I sat down to work with Sophocles's Antigone in mind. I used only some small fragments of Antigone's lament, as she is led into her death chamber: one of the most beautiful verses ever written in the history of Greek Tragedy. Oracle was the first ensemble work I wrote during my second year of my music composition studies at the University of Iowa. I believe that I gave my wonderful professor (David Gompper) a pretty tough time by simply "announcing" to him the entire instrumentation (plus the different 'sitting' of the musicians on stage!). Well, after some time he got used to my Greek/stubborn way of thinking but, at the time, I must have appeared quite amusing to him! Anyhow, he let me experiment with my ideas and (not only that) but he also found ways of assisting me (at times of inner "panic") by pointing out to the vast possibilities I had in terms of using my imagination (which he knew I had plenty of)! String Quartet No.1 was composed at the University of Iowa in 1999 and, a year later, my composition professor (David Gompper) proposed it as my Masters Thesis. Anyhow, this music composition was completed within 2 months of composing at these strange hours. I worked mostly at the kitchen table, parties going just under my window! I guess that, at the end, I felt rather amused at being able to pull something like this through! Songs And Prayers Of The Abyss is based on four poems written (in Greek) by the composer in Thessaloniki, Greece, between 1994 and 1996. The composer writes: "It took me some time to realize that these poems belonged together thematically." The main figure of the work is a woman who is seeking knowledge of the sacred. These poems of meditation represent the phases of her apocalyptic journey. Each song expresses her confidence in the knowledge she already holds: the knowledge of truth and beauty. However, each "song" is followed by an "abyss" that challenges her beliefs and shakes her confidence. With each confrontation her horror grows. 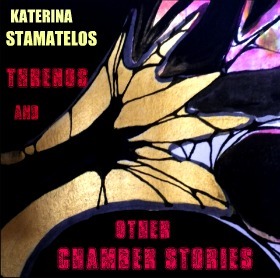 While the Songs are based on the text of the poems, the Abyss sections make use of a particular language taken from the Greek Orthodox Liturgy called teretisms. These meaningless syllables such as "terere," "tereri," and "tereru" date back to the 4th century B.C. and were presumably used to imitate instruments. In this case, the composer uses them to "reinforce the magic of invocation." (Dan Moore, from the program notes of the premiere). The title of this music composition is a "created" word (the Greek language carries in itself the capability/plasticity for creating endless new words, simply by combining/recombining its "roots"). In this case, the present music composition serves as a model-form for a series of solo works to be realized next! So, far there exists a second composition, under the same title, numbered as "II". This second one is for solo clarinet. Metamorfa I, for solo bassoon, covers a specific range of "extended techniques, such as multiphonics. Its speed is also very challenging. Cantata "The Insane Mother" served as my PhD Thesis in music composition and is based on the homonymous poem of Dionysios Solomos, the "national" poet of Greece. I chose this particular poem, because it was my father's favorite one: I had not read it until after his death. The decision to write music for this incredible poem was an instantaneous one and was mostly based upon the fact that this poem is music by itself. Obviously, the main theme here is insanity. In order to follow the trace of insanity with purely musical means, I chose to write a composition that would operate through several different and yet coinciding structures: only the soloists and the chorus singers would follow the natural structure of the poem, stylized as in an Ancient Greek drama. Having as my guide the despair of the Greeks in confronting death and their complete denial to accept any comfort as offered through Christian faith, I soon started exploiting the suffocating atmosphere of a typical Greek Orthodox cemetery (the second title of the poem). Raising the four double basses to a symbolic "wall of death" (an unsurmountable object), the strings form a web of indifference (the objectivity of cosmos) around mother. The three flutes are the only instruments allowed to be expressive, following the poet's inclination to present suffering through nature. The percussion, appearing through two independent patterns, represent the eternal cycles of life and death, while only the solo bass truly weeps and expresses the initial innocence, the despair, and finally the ultimate loss of sanity of the mother. Projections Split is the first music composition where my research done on the Ancient Greek/Byzantine musical systems has been applied on such a large scale! Pythagoras Biography, provides crucial information about the most famous of the pre-Socratic philosophers. Pythagoras, the Ionian Greek scientist, mathematician, politician, religious and moral reformer, is also known as a great mystic and founder of a religious circle under the name "Pythagoreanism."